How Much Will Oshawa Home Assessments Rise in 2017? Oshawa residential property assessments have been a hot topic lately, as many people realize that Oshawa has the highest municipal tax rate in the GTA. The Municipal Property Assessment Corporation (MPAC) has released projections for 2017, and Oshawa assessments will be rising at an average rate of approximately 8.3% in 2017. The map above shows the city broken down into districts and indicates how each one will change in 2017. The size of the circle represents the number of properties within each district - the larger circles contain more properties. The colour of the circle represents price - the darker circles have higher average property values. Will Taxes Go Up 8.3%? Many people are mistakenly under the impression that if their assessment goes up 9%, then their taxes will go up 8.3%. That is simply not true. The municipal tax rate (or millage rate) will be adjusted to make the average property tax increase zero before the city's budget increase is taken into account. If your assessment goes up more than the 8.3% average, then you will see an increase in your taxes due to the assessment. If your assessment goes up less than the average, you will see a decrease. If the city raises its 2017 budget by 2%, then the average homeowner will see a 2% increase on their tax bill. The last time properties were all assessed was in January 2012. Increases from previous assessments are phased in over the next four years, to help soften the blow to owners. Decreases are implemented immediately. Similarly, increases in the 2016 assessments are phased in, and are found on the bottom of assessments. MPAC may also do interim re-assessments. These can happen when a property changes due to renovation, new construction, usage change or demolition, and can happen anytime. This type of update is sent out each fall. 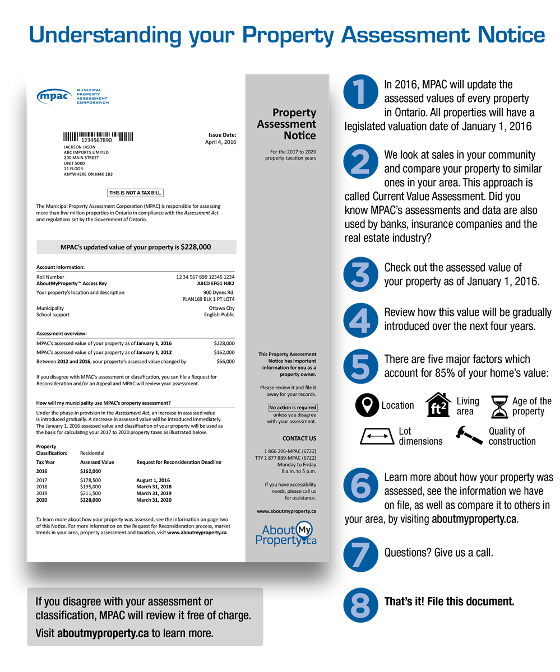 All properties were issued an assessment dated January 2016, and property assessment notices were sent by MPAC. Why Are Property Taxes So High In Oshawa?